I developed this recipe for vegetable puree based gnocchi last year using parsnips. It works with any kind of vegetable puree – so if you don’t have any sweet potato at hand, you can substitute it by pumpkin or butternut squash in the recipe below – as long as the puree is dry enough. 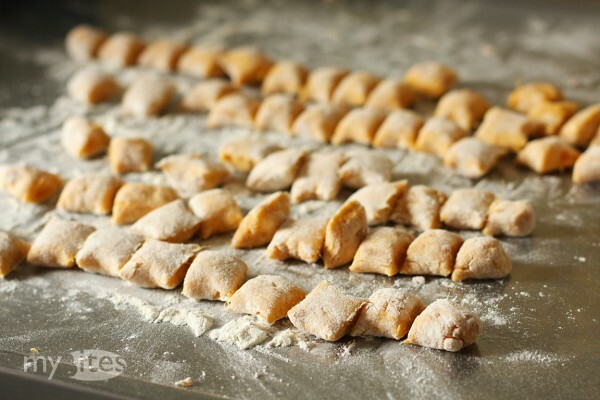 A wet puree needs more flour, which makes the gnocchi heavy and thick instead of light and fluffy. Another secret for the fluffiness is to work with a slightly sticky dough and rather add a little bit more flour on the working surface while rolling the dough out to long strands. This way the flour helps forming the gnocchi, but doesn’t get incorporated into the dough. After cooking the gnocchi I shortly roasted them in vanilla butter which gave the gnocchi a nice crust and enhanced its flavor. I’ve been inspired for this gnocchi roasting technique by desserts I tasted at MÁK Bistro in Budapest (which is by the way the restaurant of this year in Hungary according to the Hungarian restaurant guide). 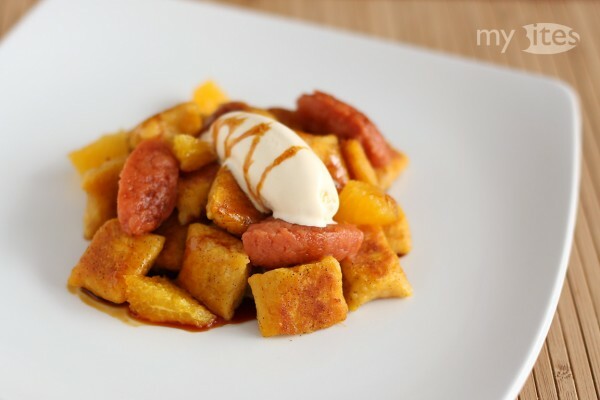 At MÁK Bistro the roasted gnocchi are usually served with a quenelle of ice cream, so I prepared a spicy cinnamon ice cream inspired by a recipe of David Lebovitz. I also added some lemon and orange zest to the ice cream base, which resulted in a more fresh and even more spicy result. As fruity components I decorated the gnocchi with orange fillets and the aforementioned quince puree. The final touch was a caramel sauce made with rooibos tea, which paired incredibly well both with the sweet potato gnocchi and with the cinnamon ice cream. Wash the quince with warm water and rub off its fur. Peel, cut in half and discard the seeds. Cut the quince in strips and add to a pot with 2 torn fresh bay leaves, 70g sugar and 200ml water. Cover and cook gently at the low heat for 6-8 hours until the quince and the syrup turns red. Cool the quince in the syrup, discard the bay leaves and drain the syrup. Gently push down on the quince to remove most of its liquid. Reserve the syrup for another use. Mash the quince using a fork or blend to a fine puree. Cover with clingfilm and refrigerate. Crush the cinnamon sticks and to a small pot along with 1 piece of orange and lemon zest. Add 30g sugar, 125ml milk, 125ml heavy cream and a pinch of salt. Cover and gently bring to a boil. Remove from the heat and leave at room temperature for 1 hour. Gently bring the mixture to a boil again and remove the cinnamon parts and zests with a slotted spoon. Whisk together 2 egg yolks in a small bowl and slowly whisk in the warm cinnamon milk. Transfer the mixture back to the pot and cook over low heat until it thickens. Add 125ml heavy cream to a bowl and place a fine meshed strainer above it. Strain the cinnamon milk through the strainer, mix well with the cream and refrigerate. Before serving, prepare the base in your ice cream maker according to your manufacturer's instructions. Cook a fresh cup of rooibos tea. Meanwhile caramelize 1 tbsp sugar until deep brown and rapidly pour in the tea. Add 1 piece of orange zest and reduce until the tea gets syrupy. Remove the zest and keep warm. If the syrup might get too thick, add a tsp water. Wash the sweet potato and tap dry with a paper towel. Wrap in aluminium foil leaving no spots where any air could escape. Bake on the oven grid at 200°C / 390 F for 1.5 hours. Remove from the oven and chill to room temperature. You can add the syrupy liquid from the aluminium foil to the rooibos caramel. Peel the sweet potato and add to a bowl with 150g flour, 1 egg and a pinch of salt. Knead to a sticky dough. Generously dust a working surface with flour, place a 2 tbsp big portion of the dough on it and dust with some flour. Roll to a long strand and repeat with the rest of the dough. Cut the strands into neat pillows and cook in boiling salted water. When the gnocchi swims at the top of the water, remove them with a slotted spoon. Melt 2 tbsp butter to a large pan and add the seeds of 1/3 vanilla pod and the pod itself. Add the gnocchi and roast on both sides until a nice crispy layer forms. Cut off the skin from the oranges, no white parts should be left. Using a sharp knife cut fillets from the orange and cut each fillet into 2 or 3 pieces. Divide the hot gnocchi between 2-4 warm plates. Add to each plate 2-3 tsp quince puree, some orange fillets and 1 quenelle cinnamon ice cream. Sprinkle with rooibos caramel and serve. Gnocchi and ice cream? I think I’m in food blog heaven. This looks truly amazing. I bet you would love the desserts at the MÁK Bistro 😉 Almost every day they have some kind of gnocchi with ice cream or sorbet on their menu. It’s a nice idea for a little bit unusual dessert. This truly looks amazing! Interesting combination 🙂 and lovely photos.